Is Indah ready to become a mother again? 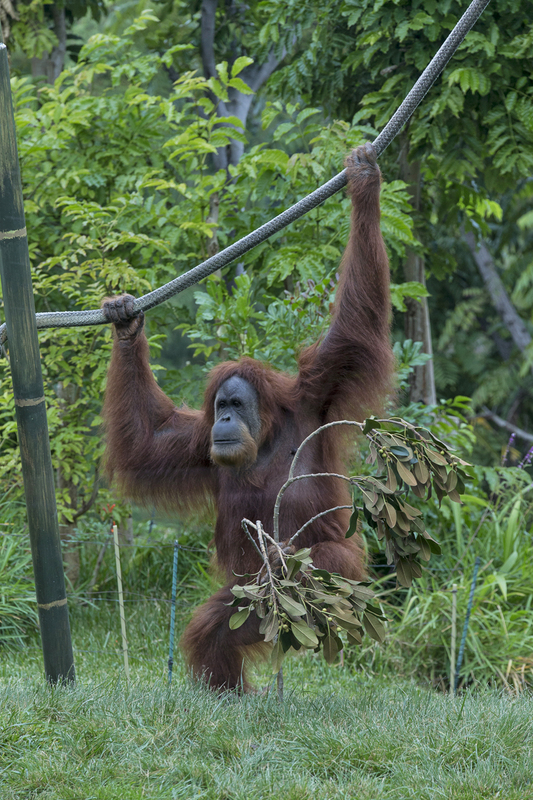 We have just been given the go-ahead by the Species Survival Plan for orangutans (a part of the Association of Zoos and Aquariums) to have a baby with San Diego Zoo orangutans Indah and Satu! Indah has been taken off birth control. She was on birth control because we did not want her to become pregnant while raising her son, Cinta. Typically, sons stay with their mother for eight to nine years. Indah had been implanted with a device similar to Norplant in humans, so she needed a trip to the vets to get it removed. Just like with humans, it may take a while for her hormones to balance out. We are hoping that this time next year we will have a pregnancy or may be even a baby! The siamangs and the orangutans get along for the most part. The assertiveness of the siamangs directed toward the orangutans at feeding times is behavior seen by researchers in the wild. We do see positive interactions with Indah and the siamangs. She shares food with them (and Satu, too!). Also, she has been playing a lot with Unkie, our male siamang, wrestling and wearing him on her head! It is really amazing to watch. 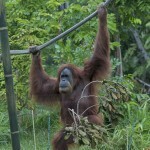 Even though our female orangutans have been hand raised, they are still wild animals. Their behavior is unpredictable, and, as such, we do not go in with any of them. There is plenty of keeper interaction with each individual with a protective barrier between ape and keeper.